New research from the Princeton Plasma Physics Laboratory (PPPL) predicts that the maximum high heat flux from the ITER Tokamak can be handled by the ITER divertor—the component at the bottom of the machine that, in extracting heat and ash produced by the fusion reaction, withstands the highest surface heat loads of the machine. The heat flux to be sustained by the ITER divertor targets is estimated at 10-20 MW/m²—or ten times the heat load of a spacecraft re-entering Earth's atmosphere. Breaking with projections extrapolated from existing tokamaks that had suggested that the heat flux could be so narrow and concentrated as to damage the front-facing plates of the divertor and require frequent repair, an international team led by PPPL physicist C.S. Chang has painted a more positive picture. Chang's team used the highly sophisticated XGC1 plasma turbulence computer simulation code developed at PPPL to create the new estimate. The simulation projected a width of 6 millimetres for the heat flux in ITER when measured in a standardized way among tokamaks, far greater than the less-than 1 millimetre width projected through use of experimental data. Physicist C.S. Chang, from the Princeton Plasma Physics Laboratory. The discrepancy between the experimental projections and simulation predictions stems from the fact that conditions inside ITER will be too different from those in existing tokamaks for the empirical predictions to be valid, according to Chang. Key differences include the behaviour of plasma particles within today's machines compared with the expected behaviour of particles in ITER. For example, while ions contribute significantly to the heat width in major worldwide facilities, turbulent electrons will play a greater role in ITER, rendering extrapolations unreliable. 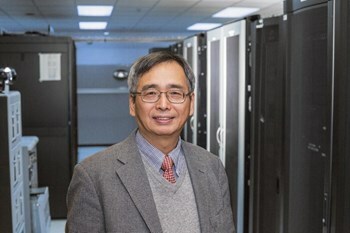 Chang's team used basic physics principles, rather than empirical projections based on the data from existing machines, to derive the simulated wider prediction. The team first tested whether the code could predict the heat flux width produced in experiments on US tokamaks, and found the predictions to be valid. Continue to the PPPL website for the complete article.